Recipe courtesy Chef Eric-Jan Fransen, Franse Stap Cookery Studio. “We work with only the best products … where the passion for cooking is central and the cuisine comes into its own.” – Chef Eric-Jan Fransen. 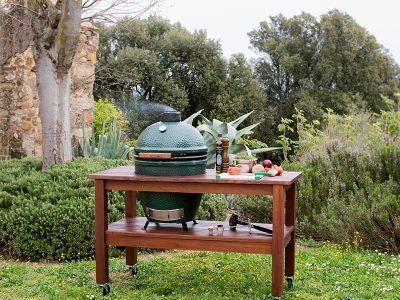 Read more about the Franse Stap Cookery Studio on page 38 of the Big Green Egg Lifestyle Magazine. From Spanish heritage-breed hogs, these spare ribs have a juicy, robust flavour. A diet of acorns creates pork infused with nutty sweetness. Set the EGG for direct cooking at 204°C/400°F. Place the ribs on the grill to brown. Partially close the dampers so that the temperature starts to drop, stabilizing at 120 to 150°C/250 to 300°F, until the meat reaches an internal temperature of 60°C/140°F. At the same time, grill the sausages until golden brown; slice into pieces.